Colin Pantall's blog: Why, Oh Why is Nothing Simple Anymore? A short story by Thomas Boivin from Tipi Bookshop on Vimeo. A Short Story by Thomas Boivin is a lovely book. It's a poetic affair, that tells the story of a relationship - from meeting across a table, to the beginning of passion, the apex, the highs and lows of a long distance relationship, final petering out into asymetrical falling out of love, separation, heartbreak and desolation. It's a universal story, and the words are universal in a way. They are not pinned down in some ways, and they are certainly not pinned to the pictures which have a floaty, nebulous feel to them. So it's dreamlike. Sadly it's one of those books that is printed in a tiny edition (100) when it could sell more. How many more is the question, but I hope he prints a second edition (of more than 100). A Short Story is a really strong example of text and image working together and it's probably (along with Yolanda by Ignacio Navas, The Spook Light Chronicles by Antone Dolezal and Lara Shipley, Yu by Dragana Jurisic, Early Works by Ivars Gravlejs, Love on the Left Bank by Ed Van der Elsken, etc etc) one of my favourites. But so many people are using supplementary elements to tell the story. At Photobook Bristol, Mark Power launched Destroying the Laboratory for the Sake of the Experiment ( a collaboration with poet Dan Cockrill and designer Dominic Brookman). This is an exploration of England which comes complete with poetry written by Cockrill, and delivered by Cockrill in Power's presentation, to accompany Mark's bang-on images of our soiled and faded nation. More conventional forms of writing came courtesy of Murray Ballard's The Prospect of Immortality. This, together with Matthieu Asselin's Monsanto (winner of the Kassel Dummy Award), is one of the outstanding examples of a long-term documentary project finding its full expression in book form. In his book, Ballard looks at Cryonics and 'the quest to overcome the ‘problem of death’. Ballard is working with the text in a more considered and reduced form than is often the case in such a documentary subject, so making the story pack a punch and serves the images, rather than simply fills space. On the Tipi table (which is a sight to behold), Andrea Copetti was showing Anne de Gelas' quite brilliant Mere et Fils and L'Amoureuse projects - both of which used extremely personal diaristic entries combined with sketches of heartbreak, loss and rediscovered passion. It really is quite beautiful. Other books on the Tipi table showed the book form developing as object. Antonio Jiminez's Elite Controllers being one example of this.This is also an example of the merging of bookseller, publisher, gallerist and curator, a role that Martin Amis of Photobookstore has also taken on. That is pretty much what Yumi Goto is as well. She talked about and then showed examples of work made through her Reminders Project Stronghold workshops. Again, text figured large in punching through extremely personal stories, but so did extremely intricate and beautiful design. Both Hajime Kimura (who brought his beautiful Snowflakes, Dog, Man book) and Hiroshi Okamoto (who brought his intricate and tragic Recruit book - runner up in the Kassel Dummy Awards) are examples of this. But something can be good without that clarity. A case in point is the puzzle that is Eamonn Doyle's new book, End.. This comes with music, thirteen inserts, a glassine poster, a yellow cellophane wrapping that over-intrigued me (you can read all about it my review on Photo Eye next week)... Actually even reading the contents confuses me and gives me a headache. But I like it and it works and it's coming from a very different direction from just about everything. End. 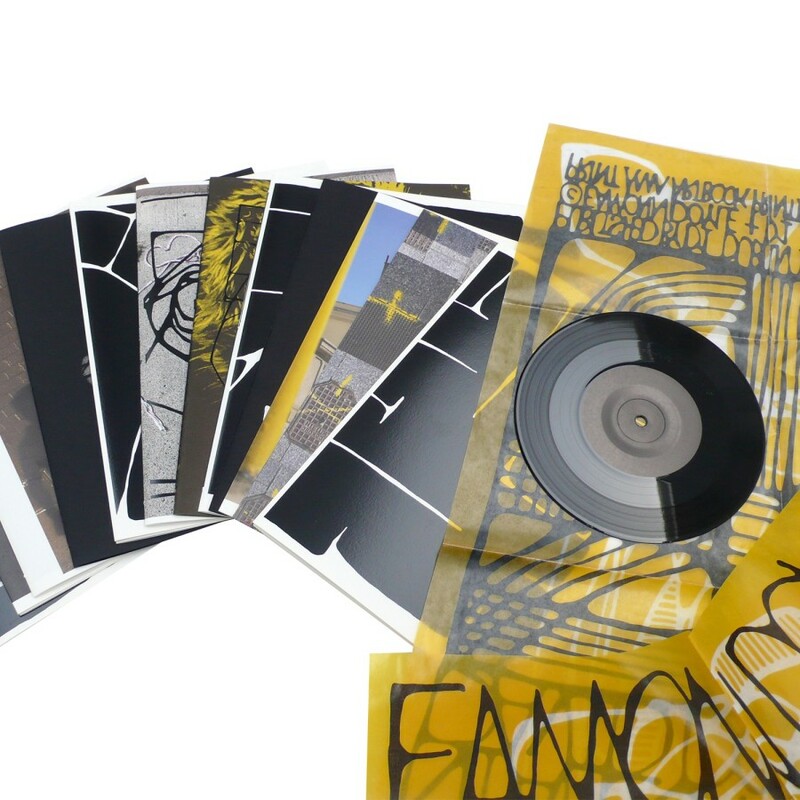 is a set of 13 sections all brought together in a white leatherette slipcase, with black-embossed drawings and tip-in title sheet, wrapped in yellow cellophane. Each section is folded to 200 x 280 mm, portrait. One yellow book, thread sewn, printed in black duotone with screen-printed drawings. Two black books, thread sewn, printed with silver inks. Three full-colour books, thread sewn, with screen-printed drawings. Four concertina-folded double-sided diptychs in full-colour with screen-printed drawings. One large full-colour double-sided folded map. One 7” vinyl record tucked inside a printed and folded glassine poster. At the centre of the work is a concertina-folded double-sided full-colour triptych. So everything is getting more involved, personal and generally difficult. Which is a good thing. But you can have too much of a good thing because when it's done badly, the design becomes redundant and all you are left with is a mulch of inserts, pull-outs and shabby stitching that can't disguise the crapness of the content. So it was refreshing to see Hoxton Mini Press's books. These are beautifully made and presented books that are a kind of an upscale variation on the Cafe Royal Model with a nod towards the Useful Photography brand of content. The books cost £12 and the special editions (which look fantastic) cost £40. So there's accessibility in pricing. And the content is great. My favourite was Ronni Campana's Badly Repaired Cars. It's simple but it's pushing the book form in a different way. Photographers, designers, publishers, booksellers, everybody's pushing the book form in a different way, and those ways are not always in the same direction. There's a lot going on. What it all means is, as always, another question that neither I nor anybody else seems to have an answer to.